David was nominated for the prestigious award of Wedding Magician of the Year by the Wedding Industry Experts and duly received more votes than any other magician worldwide! 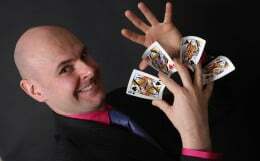 This highlights his calibre as the top magician in the Solihull area, and indeed the West Midlands. For your wedding in Solihull, look no further. David Fox will deliver an unforgettable performance of close-up magic during the drinks reception, carefully co-ordinated table magic throughout the meal, and fantastic illusions to keep everyone mesmerised in the early evening celebrations. Whatever your venue, from Hogarth's Hotel on Four Ashes Road, to the Limes Country Lodge Hotel on Forshaw Heath Lane, the magic of David Fox will ensure that your wedding is exceptionally special and unforgettable. 1. 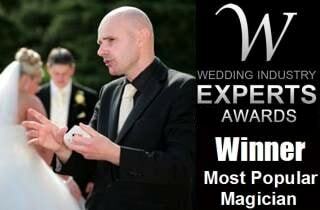 David is the top wedding entertainer in the Midlands today having a massive amount of experience. 2. 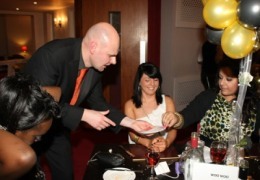 David's magic is suitable for all age groups from the younger guests right up to the grand parents. 3. Regardless of your schedule and unique requirements, David Fox will customise an appropriate package for excellent value. 4. Your guests will be full of praise, respect and appreciation for the wonderful choice of entertainer you made! 5. Exceptional magical effects and routines will get everyone talking and interacting on the day. David creates his own exceptional magical illusions which have to be seen to be believed.